Sports, recreation, and leisure are so entwined with life in American and the human experience itself, it should not be surprising that many of the collections held at the American Heritage Center contain at least some information related to these endeavors. Though Sports, Recreation, and Leisure represent one of the center’s smaller collecting areas, the AHC holds about 500 collections that contain significant amounts of material related to these topics. Our main areas of focus include mountaineering, rodeo, dude ranching, national parks recreation, adventure travel and sports writers, and, not surprisingly, University of Wyoming athletics. By far the most popular sport-related interest is with the University of Wyoming Intercollegiate Athletics Records. 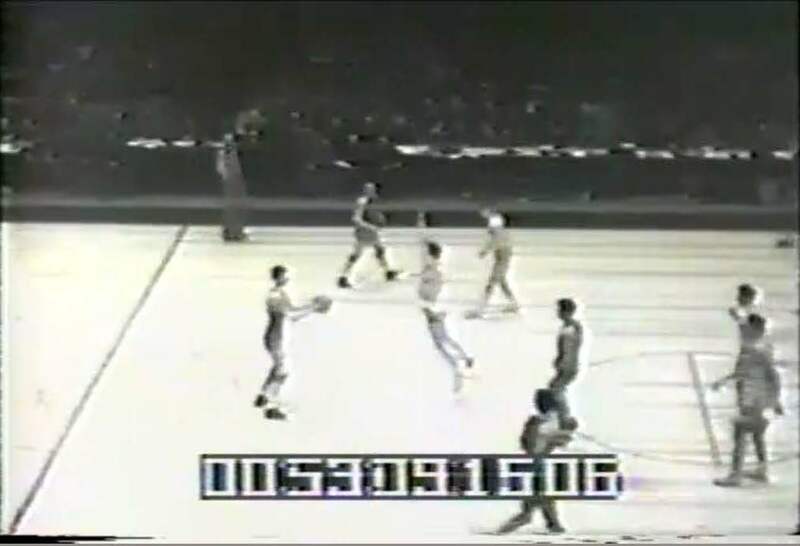 Fans, former athletes and their families, sports writers and filmmakers often request copies of game footage especially for memorable games such as the 2007 WNIT Championship where the women’s basketball team knocked off Wisconsin, and the football team’s 1958 victory over Hardin Simmons in the Sun Bowl and their 1968 Sugar Bowl appearance against LSU. The collection contains films dating back to the 1930s. Let’s not forget the men’s basketball team’s crowning as national champions in 1943!—in fact, recently two independent documentary film teams have visited the AHC for prospective programs on this amazing feat. Indeed, the most popular aspect of UW sports, recently, has been Kenny Sailors, the inventor of the jump shot and member of the 1943 championship team. The AHC is pleased to announce that recently 90 films from the University of Wyoming Intercollegiate Athletics Records were digitized and are now available online. Film still of 1943 NCAA National Basketball Championship Team (University of Wyoming vs. St. John’s). University of Wyoming Intercollegiate Athletics Records, #515001, Boxes 266-267. UW sports material can be found in a variety of contexts. Milward Simpson’s collection of papers consists of more than 600 boxes of material mostly related to his political career. However, amidst all of those political files, is a box containing a small amount of material related to his time as a three-sport athlete at the University of Wyoming. For those patrons who prefer a bit more dirt and mud, the AHC holds numerous prominent rodeo collections including Abe Morris, a UW African-American student who was one of the Professional Rodeo Cowboy Association’s (PRCA) premier bull riders in the 1980s and 1990s, and the J.S. Palen Collection that contains rodeo history of numerous western rodeos including Cheyenne Frontier Days– posters, photos, correspondence, scrapbooks, publications, schedules, and much more—from the 1890s to the 21st century. 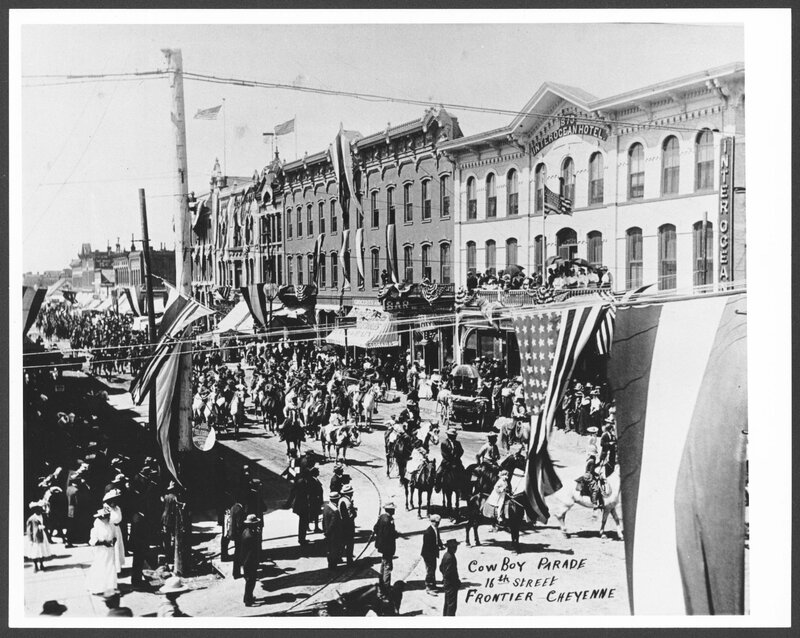 Cheyenne Frontier Days parade, early 20th century. J.S. Palen papers, #10472, Box 24, Folder 1. University of Wyoming, American Heritage Center. For those who wish for a bit more peace and quiet, the many dude ranch collections and national park collections contain material to help slow the soul. Dude Ranch holdings range from individual ranches including Eatons’ Ranch, often referred to as the nation’s first dude ranch, located in the Big Horn Mountains near Sheridan as well as organizational records including the Dude Ranchers Association Collection. National Park collections range from the personal collections of park rangers like Karl Allan who worked in numerous Western parks including Yellowstone and Grand Teton, to park concessioners like Howard Hays who operated camps sites and a stagecoach line in Yellowstone. If one wishes to venture beyond the comfort of the dude ranch nestled in the foothills and aspires to reach lofty heights, the AHC holds more than 50 mountaineering-related collections. Some climbing documentation is found in unsuspected places. Charles Coutant was a Cheyenne newspaper editor and author of an 1899 history of Wyoming. His small collection of papers contains five letters by Nathaniel P. Langford to Coutant regarding Langford’s exploration of the Teton and Yellowstone areas in 1870, including Langford’s ascent of the Grant Teton. Much more prominent is a collection from Betsy (Cowles) Partridge who was among the earliest women and Americans to attempt Mount Everest in 1950. Her collection includes diaries and photo albums of her many climbing expeditions. In the past few years a biography of her was published, as well as a few articles. For those who enjoy learning more about sports and outdoor recreation from reading about it in the comfort of the recliner, the AHC has numerous collections from writers including Warren Page who was an editor of Field & Stream Magazine as well as a world-class big-game hunter, and Murray Olderman who was a prolific sports writer including writing scripts for ABC Sports Radio. The Center holds numerous travel and adventure writers’ paper including Buddy Mays whose writing ranged from whitewater rafting adventures to sight-seeing in the Desert Southwest. Barnstorming? We have at least half a dozen collections documenting this sport, including the papers of Roscoe Turner, who liked to perform stunts with his pet lion (yes, lion) accompanying him in the plane. We also have the collection of Roger Williams, now essentially unknown, but a pilot in both world wars. Roger Quincy Williams (1894-1976) became a barnstormer and stunt flyer during the 1920s. In 1929 he became the second flyer to cross the Atlantic, flying from New York to Rome. 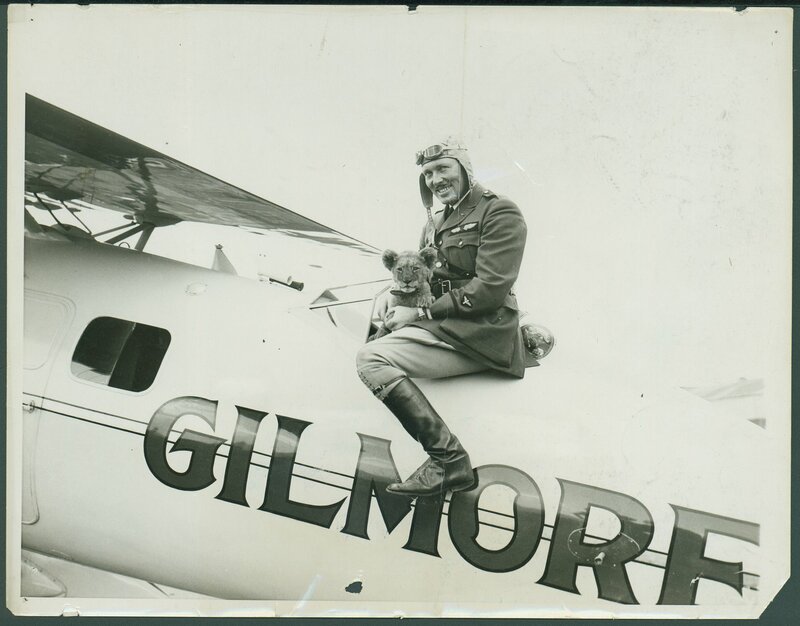 Roscoe Turner and Gilmore the Lion sitting on plane. Roscoe Turner papers, #5267, Box 113, Folder 7. University of Wyoming, American Heritage Center. We’ll close with materials relating to sports journalists, from both print and broadcast venues. Take, for instance, Barbara J. Brown who was a journalist who covered the American rodeo circuit. She had articles in such periodicals as World of Rodeo, Pro Rodeo Sports News, Rodeo Times, Western Sportsman, Hoof and Horn, and Western Horseman. Or take Henry E. Bradshaw (d. 1981), an outdoor journalist who, throughout his long career, contributed to Field & Stream, Outdoor Life, and Sports Afield among other publications. Bradshaw, along with his wife, Vera Foss Bradshaw, wrote more than 3,000 outdoor and travel articles. We also hold the papers of legendary sports television broadcaster Heywood Hale Broun, as well as collections by radio sports commentators and even illustrators. When it comes to the history of sports, recreation, and leisure, the American Heritage Center holds something for everybody. This entry was posted in Athletics, aviation history, Journalism, Recreation, Sports and Recreation, University of Wyoming history and tagged Barnstorming, Leisure, Recreation, Rodeo, Sports, Sports Journalism, University of Wyoming Athletics. Bookmark the permalink.